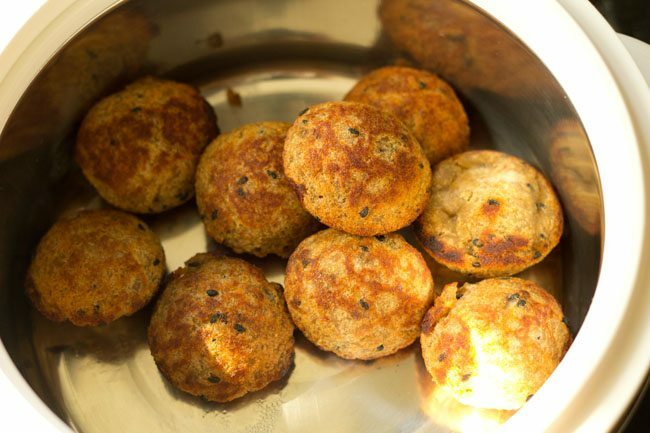 banana appam are sweet appam or paniyaram made with ripe bananas, rice flour and jaggery. 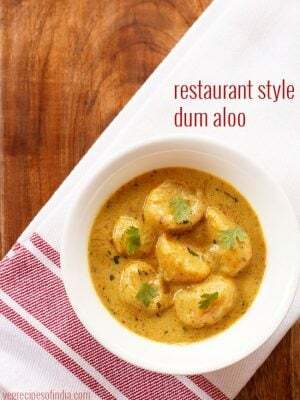 banana appam recipe with step by step photos – sweet appam or paniyarams made with ripe bananas, rice flour and jaggery. 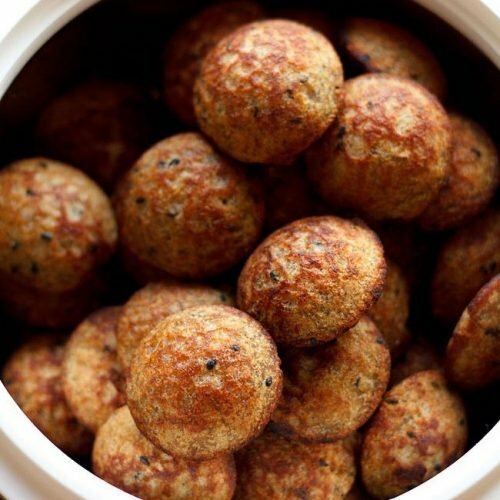 these banana appam make for a healthy sweet snack. i used over ripe bananas to make these. 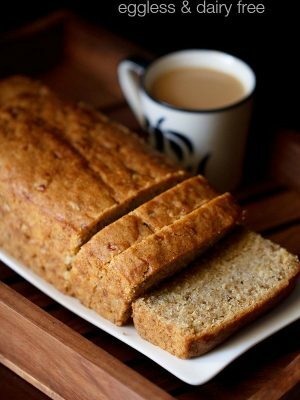 though you can even use ripe bananas. i have added more bananas than what is generally added in appams. you can make these and store them in an air tight box in the fridge. 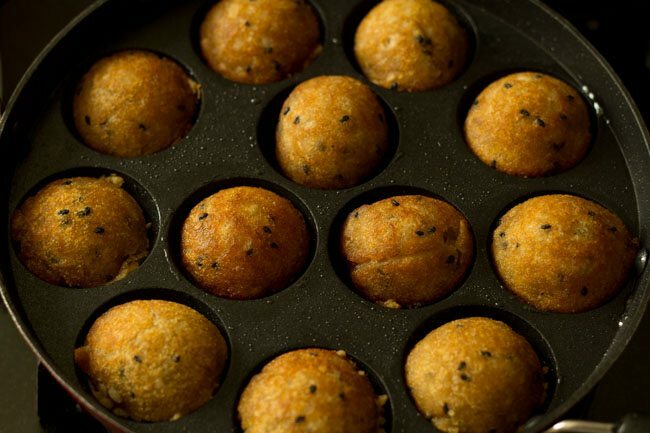 to make the banana paniyaram, you need the paniyaram chatti or appe pan – Æbleskiver pan. you can also shallow or deep fry these appam, if you don’t have this special cookware. even the shallow fried or deep fried appam stay for a good number of days. 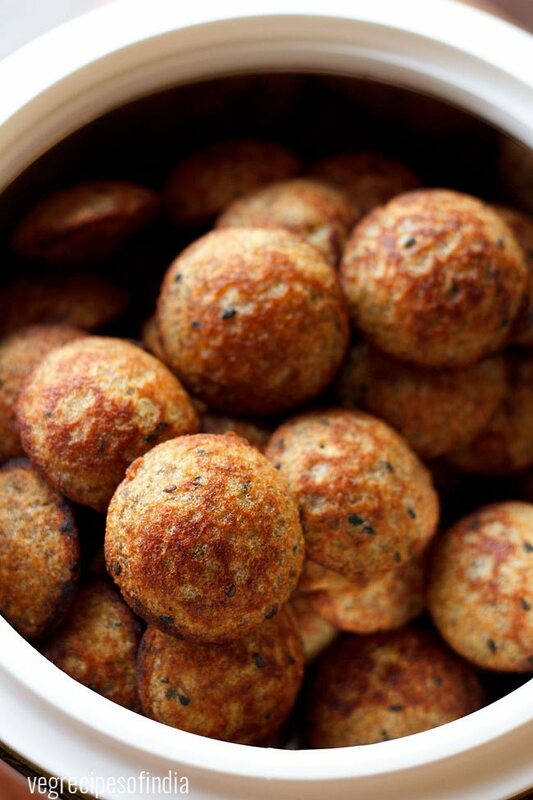 these banana appam have a soft texture and are crisp when hot. on storing the crispness will go away, but the softness will be there. 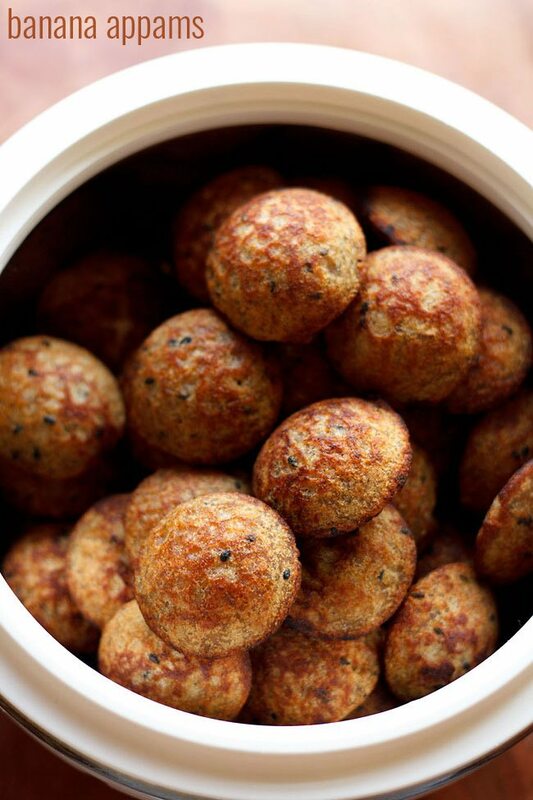 refrigerate the remaining appam and they stay good for a week to 10 days in the fridge. 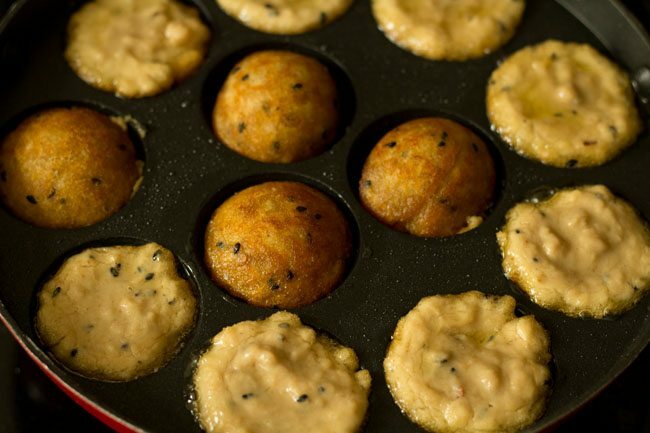 serve the banana appam, hot or warm or at room temperature. they also make for a good tiffin box sweet snack. first chop 100 to 105 grams jaggery. 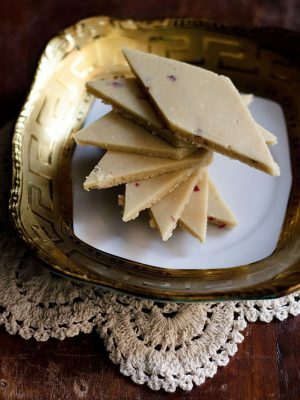 you should be able to get 1/2 cup chopped jaggery. you can also use jaggery powder, instead of chopped jaggery. 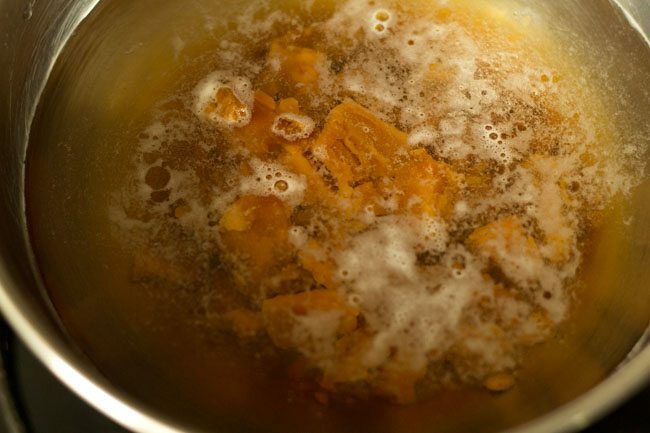 then add the jaggery in a bowl or pan containing 1.5 cups water. keep the bowl or pan on low to medium flame and let the solution heat through. stir so that the jaggery melts. you just need to melt the jaggery. when the jaggery melts, then filter the syrup and keep aside. 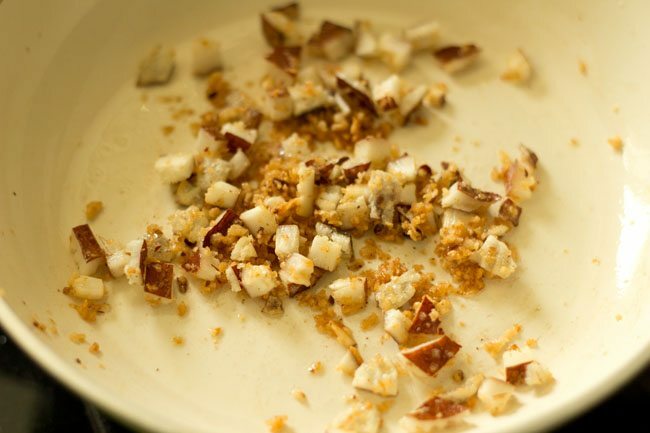 now chop a small piece of coconut in small bits. you will need about 1/4 cup chopped coconut. 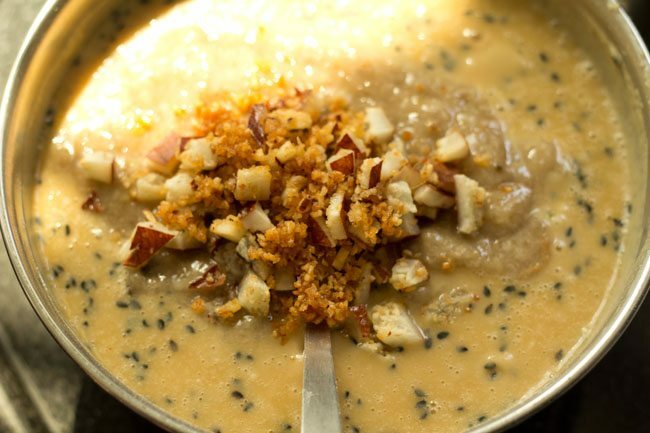 you can even use grated coconut or you can skip coconut altogether. heat 2 teaspoons ghee in a pan. then add the chopped coconut. stir often and saute them till they are light golden. keep aside. 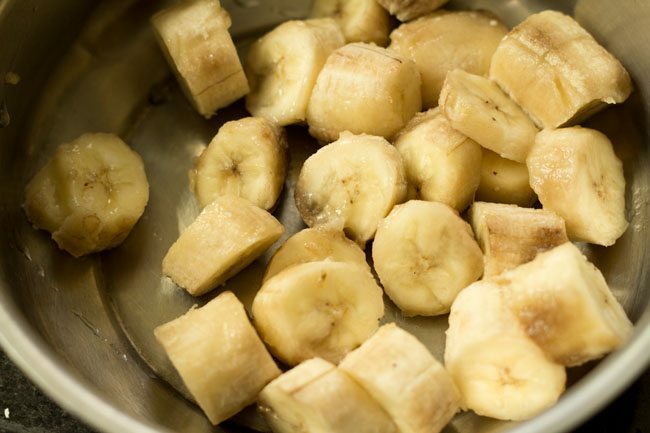 in a pan, peel and chop 3 small to medium bananas. about 250 grams bananas. mash the bananas with a fork or masher very well. there should be no chunks in the bananas. you can even puree the bananas in a blender. now add 1/2 tsp cardamom powder, 1/2 tsp ginger powder and 1/4 tsp cumin powder. mix very well. 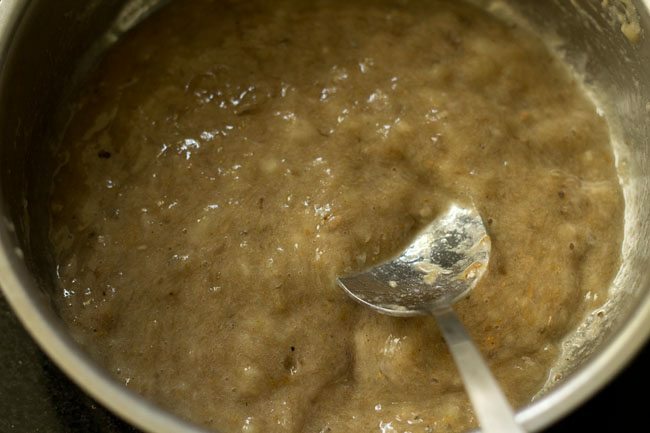 to the bowl containing the jaggery solution, add 1.5 cups rice flour. add 2 teaspoons black sesame seeds. 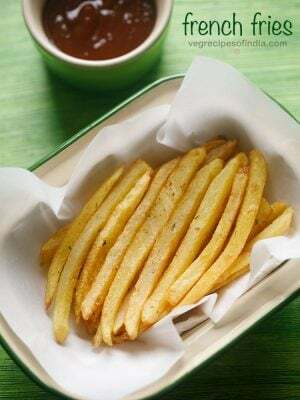 you can also use white sesame seeds. begin to mix very well. 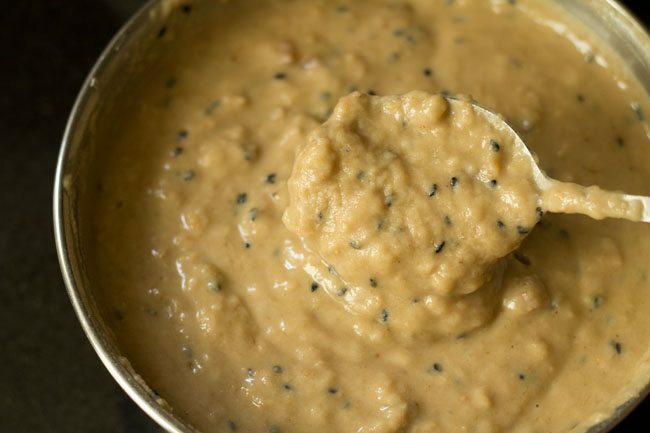 make a smooth batter without any lumps. 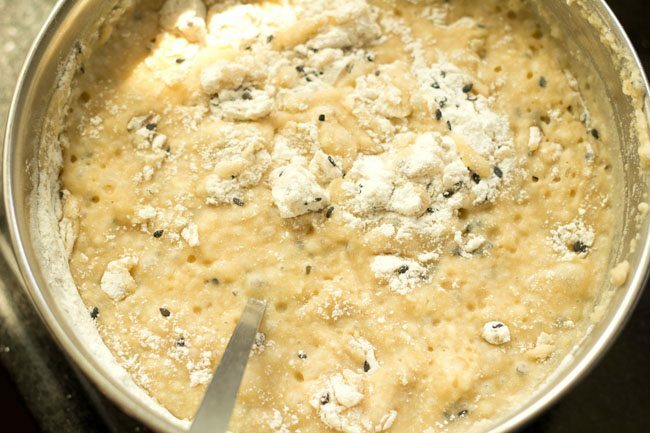 add the pureed bananas to the rice flour mixture along with the coconut. add 1/2 teaspoon baking soda. baking soda makes the texture more porous and soft. if you want you can skip too. 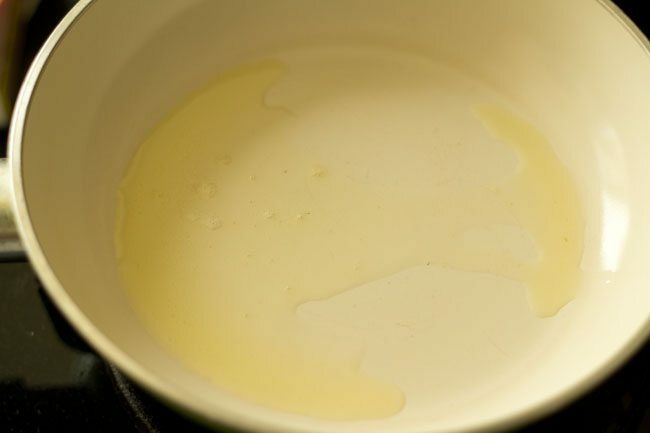 heat the appe pan and add 1/2 to 1 teaspoon ghee in each mould. instead of ghee you can use coconut oil too. with a spoon, pour the batter till 3/4 or more than 3/4 in each mould. keep the flame to low or medium and cook the appams. with a wooden/bamboo stick or skewer, turn over the banana appam which have become golden. when the rest of the banana appam are golden, turn them over too and cook all of them till crisp and golden. once done remove and place them in a casserole. in the casserole they stay warm for some time. same way prepare the remaining banana appam. the recipe yields 42 banana appam. you can store them in an air tight box or container in the fridge. serve the banana appam, hot or warm or at room temperature. 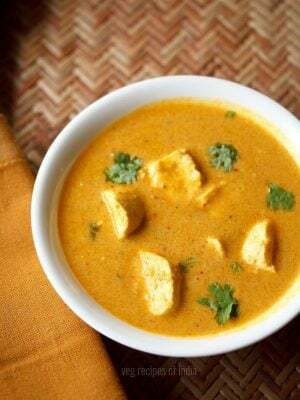 you can substitute coconut oil or sunflower oil instead of ghee. ginger powder and cumin powder are optional and can be skipped, if you do not have them. 1. first chop 100 to 105 grams jaggery. 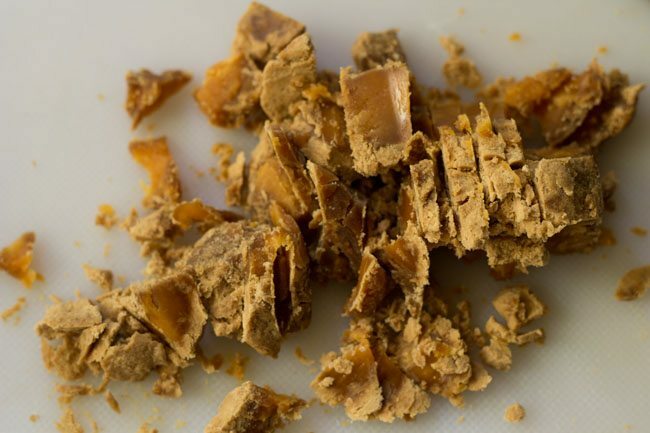 you should be able to get ½ cup chopped jaggery. you can also use jaggery powder, instead of chopped jaggery. 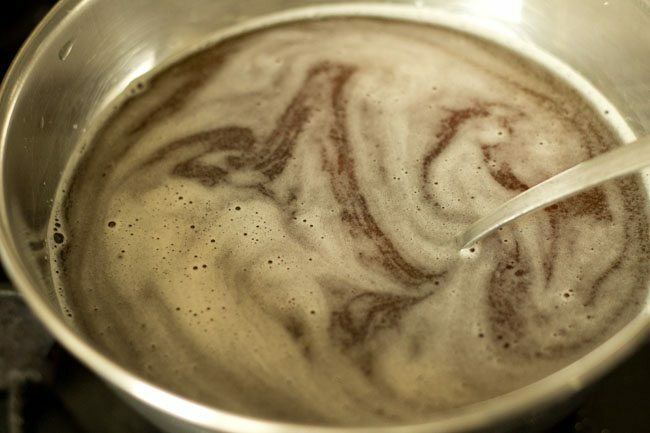 2. then add the jaggery in a bowl or pan containing 1.5 cups water. 3. keep the bowl or pan on low to medium flame and let the solution heat through. stir so that the jaggery melts. 4. you just need to melt the jaggery. when the jaggery melts, then filter the syrup and keep aside. 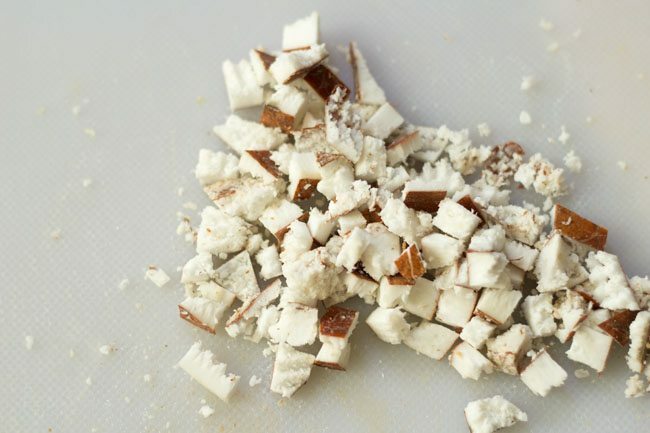 5. now chop a small piece of coconut in small bits. you will need about ¼ cup chopped coconut. you can even use grated coconut or you can skip coconut altogether. 6. heat 2 teaspoons ghee in a pan. 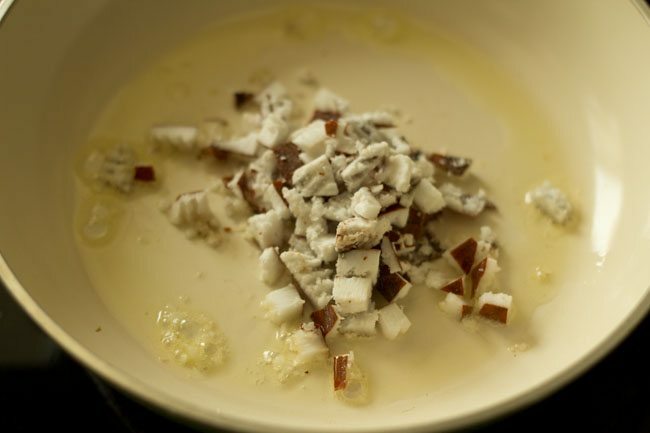 7. then add the chopped coconut. 8. stir often and saute them till they are light golden. keep aside. 9. in a pan peel and chop 3 small to medium bananas. about 250 grams bananas. 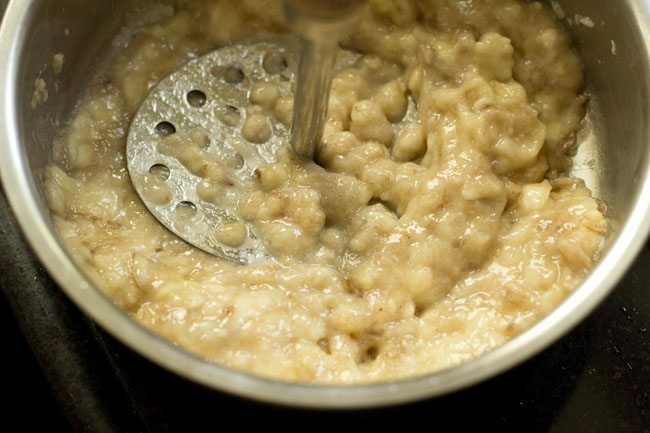 10. mash the bananas with a fork or masher very well. 11. there should be no chunks in the bananas. 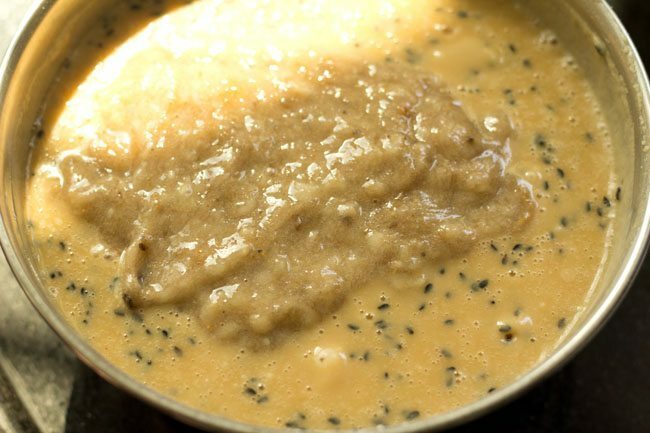 you can even puree the bananas in a mixie or blender. 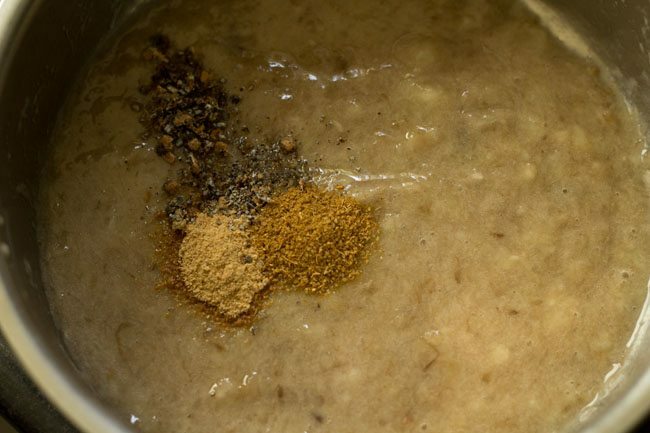 12. now add ½ tsp cardamom powder, ½ tsp ginger powder and ¼ tsp cumin powder. ginger powder and cumin powder are optional and can be skipped, if you do not have them. 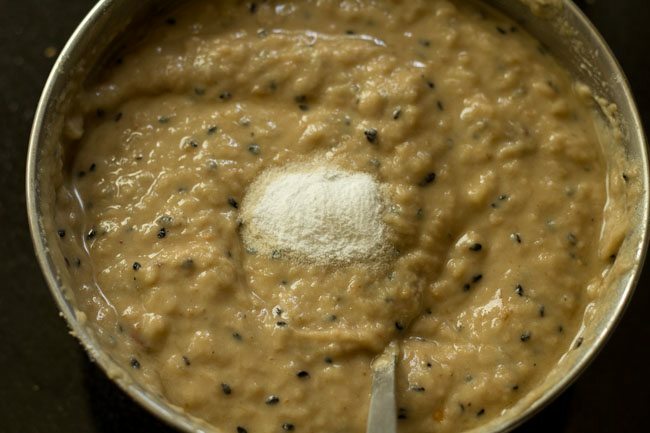 14. to the bowl containing the jaggery solution, add 1.5 cups rice flour. 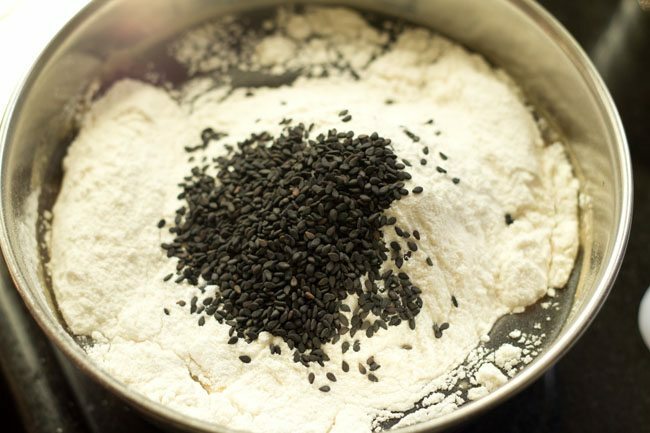 15. add 2 teaspoons black sesame seeds. you can also use white sesame seeds. 16. begin to mix very well. 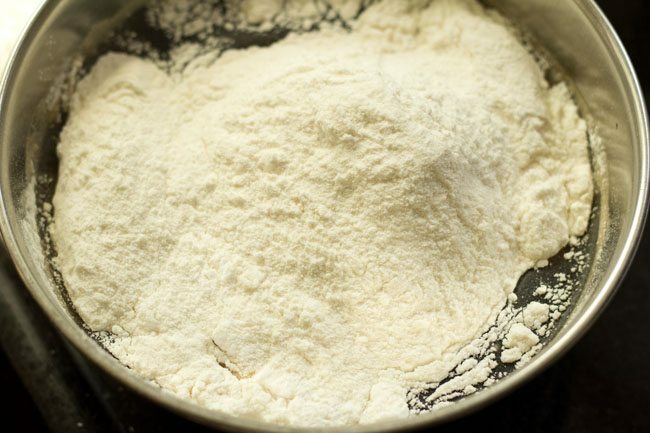 17. make to a smooth batter without any lumps. 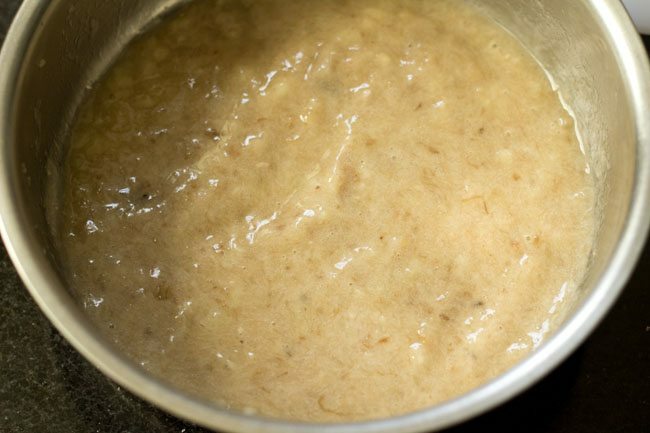 18. add the pureed bananas to the rice flour mixture. 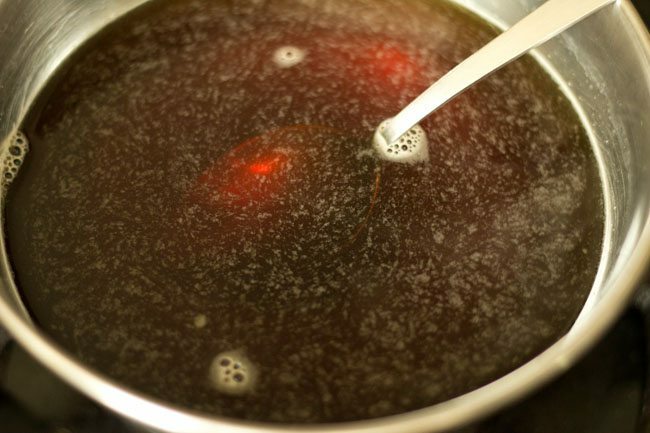 20. add ½ teaspoon baking soda. baking soda makes the texture more porous and soft. if you want you can skip too. 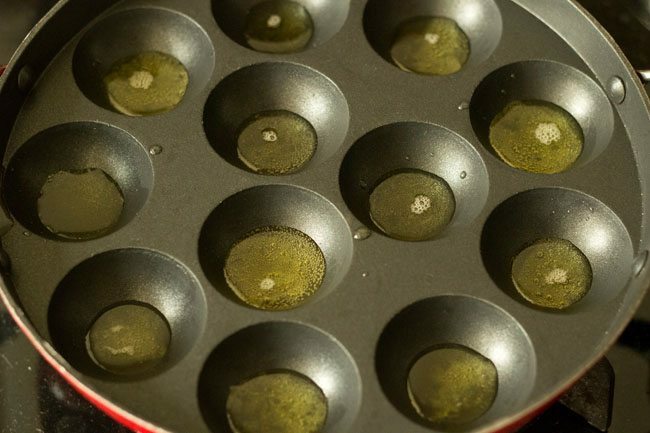 22. heat an appe pan and add ½ to 1 teaspoon ghee in each mould. instead of ghee you can use coconut oil too. 23. with a spoon, pour the batter till ¾ or more than ¾ in each mould. 24. keep the flame to low or medium and cook the banana appam. 25. with a wooden/bamboo stick or skewer, turn over the banana appam which have become golden. 26. when the rest of the banana appam are golden, turn them over too and cook all of them till crisp and golden. 27. once done remove and place them in a casserole. in the casserole banana appam stay warm for some time. same way prepare the remaining banana appam. the recipe makes for 42 banana appam. you can store them in an air-tight box or container in the fridge. 28. serve the banana appam, hot or warm or at room temperature. Welcome Tessy. Glad to know that you liked the recipes. Welcome Shweta. Glad to know this. Thanks for your positive feedback. 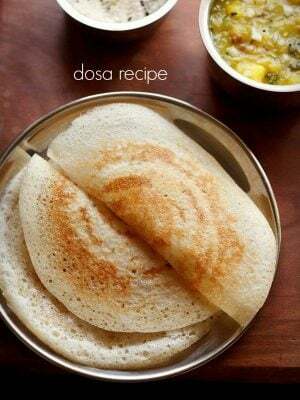 I kindly ask you, can I bake this banana appam? you can bake them. just add 2 to 3 tablespoons coconut oil in the batter and mix very well. then bake them at 180 degrees celsius till the tops are golden. I love all your recipes. Kudos to you! Il try this recipe in Otg and will let you know ,how it turned out. 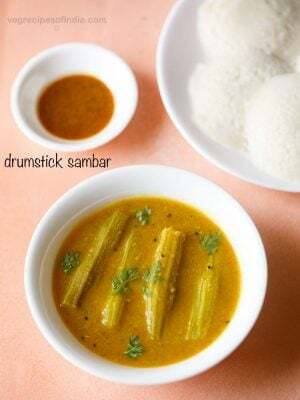 thanks amruta for positive views, surely try and let u know how the banana appams were? Your recipes are easy to follow. Really good work and nicely presented. Thanks for sharing. thanks suseela for positive views and you are welcome. thanks shailesh. just decrease all the ingredients by half, proportionately, except ghee. ghee can be 1/2 or 1 teaspoon for each appam mould. very nice. I just tried d and it came good. how long batter ll be good if refrigerated? thanks jayashree. you can keep for a day in the fridge. the pan is either not seasoned well or of not a good quality. i had such a pan and every time i would struggle making appe in it, even after seasoning it. for seasoning, heat the pan and spread oil in each mould. switch off the flame and keep the pan with the oil coated in the moulds for a day or two. then before making appams, wipe the oil. place the pan on flame and spread oil again. wipe again and you can do this once more if you want. then make appams in it. Hi Dassana, thank you for the recipe. 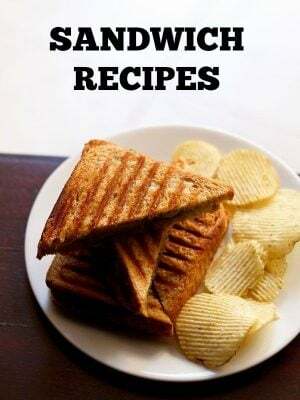 I have made many recipes from your collection and love them. please advise if these can be made in the oven using muffin tins? thank you! welcome vini. you can make these in the ovens. 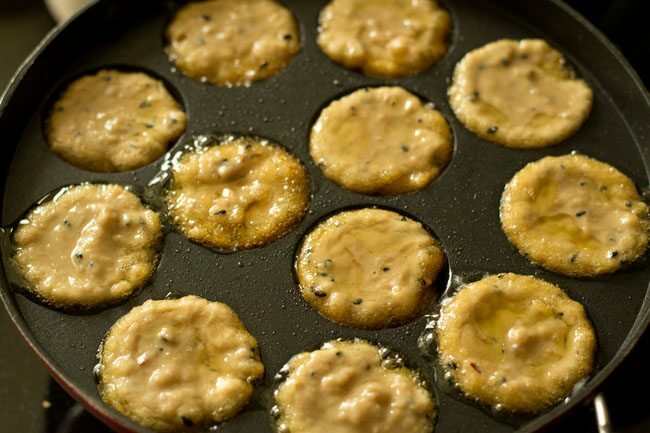 just a suggestion would be to add 1 to 2 tablespoons oil in the batter, so that the appams become slightly crisp. also add baking soda as it will help the appams to rise while baking. 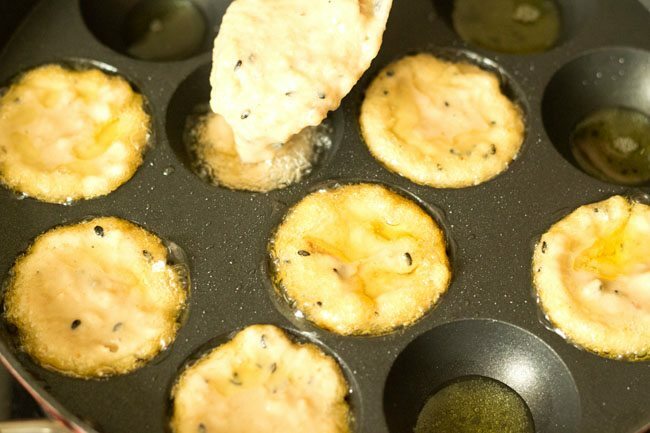 use muffin liners or grease the muffin tins very well. Thanks a bunch for sharing the same Dasanna. Kindly let me know if you have used robusta banana or any other one? these were made with robusta bananas. 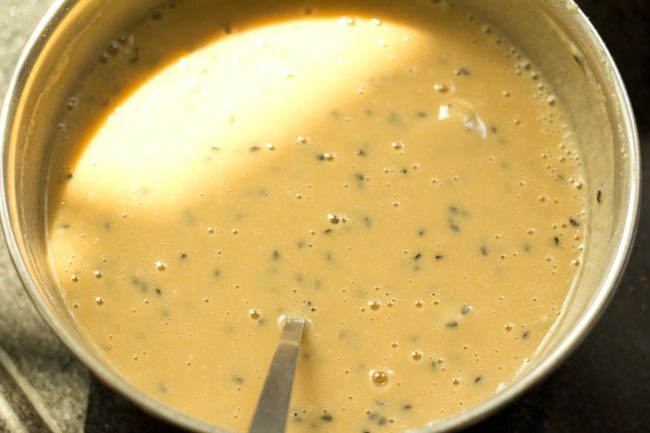 Is it possible to make the batter ahead of time and refrigerate it?? ?